Ameno: Hi. Ready? Please, introduce yourself. Warlock: Hi. 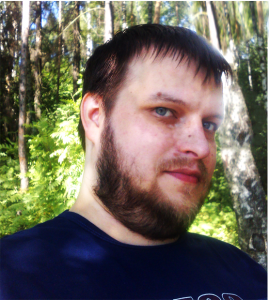 My name is Andrey, I am 31. In Travian: Kingdoms I am currently known as Warlock on Ru3. Ameno: Great! And who are you known as in real life? Tell us a little about yourself. Warlock: I was born and grew up in Balashiha, small high-crime town not far from Moscow (a bit of exaggeration, but still). Currently not working. But when I was young and naive, I wanted to know all the laws and interpret them correctly, so, I graduated from the university as a lawer. Ameno: But if I understand correctly, you didn’t make it your profession, right? Warlock: Exactly. I found it pretty boring by now. However, my education helped me a lot when I worked as an accountant, a financial analyst and even took part in construction of Olympic objects in Sochi for the Olympic games 2014. Ameno: Wow! So, you’re a true World Wonder builder not only ingame, but also in real life! Let’s talk about Travian. For how long have you already been playing Travian: Kingdoms? How did you know about the game? Did you play Legends before you started playing Kingdoms? Warlock: Oh, that’s a lot of questions! I first started playing Travian in 2006. It was Legends, of course. My younger brother found this game and we joined the game together. I learned about Kingdoms, when I got an invitation for alpha-test. I tested it, liked it way more than Legends. Since then I play Travian: Kingdoms. Ameno: Do you play solo or in a team? Tell me about your game: what tribe do you prefer? Are your an offensive or a defensibe player, or it’s just a matter of chance and your mood? Warlock: I normally play with a small company of my friends, who I can trust and who don’t let me get bored. It’s a very comforting play, and additionally you can always get help. I prefer offensive style, when I know that I can spend quite a lot of time ingame. But when time is limited I can also play as a defender. My favourite tribe is Romans, of course! They are very strong due to their economy aspect. Also they have wonderful cavalry – Equitee Imperatoris – which are ideal for farm. And, of course, because they have so beautiful red roofs (laughs). Ameno: Do you play other games apart from Travian: Kingdoms? Warlock: I tested several similar games, but I stopped playing soon. I definetely like Travian more. Non-browser games – I very much love Heroes III, Starcraft and Dota. Ameno: Are you just a player or an active forum user as well? Do you communicate on Travian: Kingdoms forums? Which threads do you find most interesting? Warlock: I often visit forum, but I don’t chat there a lot. What I like doing is writing some guides for mostly for new (but some are for advanced as well) players. I publish them on forum (I am Magus there). So, this thread is the most interesting for me as well as Questions about the game area. Unfortunately there aren’t enough guides even for Travian: Legends with its looong history, let alone for Travian: Kingdoms. But we hope to change it, we – I mean the community of course. And I’ll do my best to help with that, of course. Ameno: Do you use any external tools to play Travian: Kingdoms? Where do you mostly get information? Warlock: I use only travian.kirilloid.ru. Actually there is enough information in the wiki and ingame help. You just need to use it the right way. Ameno: What do you believe to be the greatest challenge and greatest achievement in Travian: Kingdoms? Warlock: The most difficult part in the game is to gather a team which would show good and stable results during not only one round, but several rounds in a row. I guess, if one does it, this is the ultimate achievement in the game as well. Ameno: Would you like to change something in the game? Warlock: Hmm, change…? Not an easy question. Actually I don’t have any major ideas. The only thing… I don’t want artefacts to appear in Travian: Kingdoms, like they are in Travian: Legends game. I really liked the T:L version before T3.5. Ameno: I know that you used to be an alliance leader, which became the game world winner. How was it? Was it an interesting or a boring round for you? Warlock: Yes, it was on the very first Ru open beta (Ru-1-1) We joined the game with the small number of fellow players, found some (very few, too) allies and won against outnumbered enemy. So, it was a usual story how a really small group of experienced players was able to win against numerous of less experienced and way less organised players. However, we were pretty close to be defeated. The final result was achieved during our very last operation, when we managed to conquer one of the enemy’s WWs and completely destroy the second enemy’s World Wonder by our greatest hammer just 4 seconds before the 100th level of our World Wonder was built. Something like that. No, it was definetely not a boring round. Ameno: I’ve heard about your experiment with no-gold play. How it goes, what can you say about it? Warlock: Yes, I tested if it’s possible to play Travian: Kingdoms without gold. It was because some players were complaining that this game is impossible to play without buying gold and I wanted to prove that they are wrong. This is still an ongoing experiment. Travian Plus and crop/resource bonuses, of course, are unnecessary luxury for me, but even without those bonuses by the midgame I was in top-20 by population, had a considerable number of praetoreans and 1000 Equitee Caesaris and 1 ram (for hideouts). By selling hero equipment and stackable items on auction, I got some gold in return, which I use for NPC-trader from time to time (also I received some gold from card game). Now the server where I held that experiment is in its final stage. There were some attacks with cattas against my villages recently, but I am still in top-20 by population and in top-100 by attack and defense, and also I am one of the most active suppliers of our WW. Ameno: And that’s perfect. Thank you for this interview. 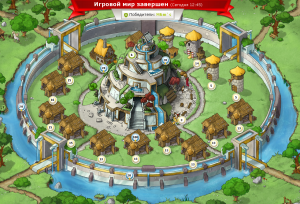 I wish you lots of new emotions – positive ones, of course – and many new victories in Travian: Kingdoms! Warlock: Thank you! Will do my best. Good luck to you, too!